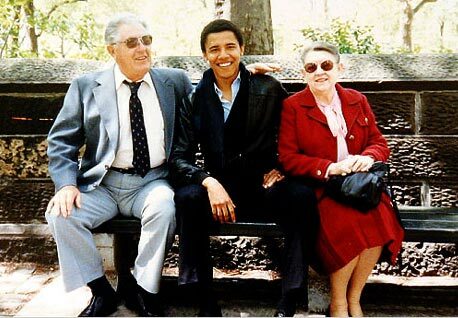 Today World Net Daily published a lengthy column claiming that Barack Obama had been photoshopped into the top photo with his white grandparents. Because he couldn't have been with them in New York City and in Kenya/Indonesia/Pakistan at the same time. However Media Matters points out that in fact it's WND's image that is photoshopped, as evidenced by the fact that they didn't even take out the president's leg. Hilarious. Sad and repulsive, but hilarious.